Trying My Hand….At Lapin Au Vin! 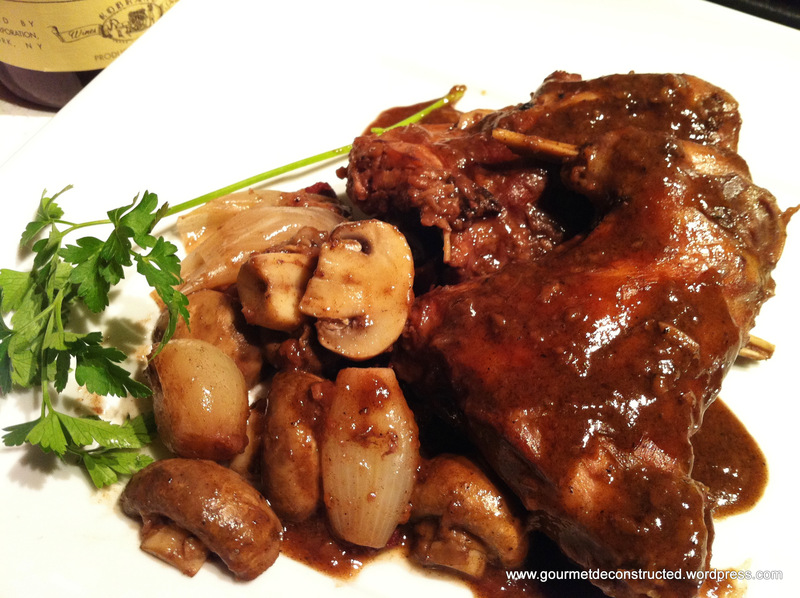 This is a delicious rabbit casserole, cooked in red wine with pearl onions and mushrooms. Just like most casseroles, this benefits from being prepared the night before, cooled and then reheated when needed. Preheat oven to 350 degrees. Put flour in plastic bag and season the rabbit with salt and pepper, then add to bag with the flour and coat evenly. Heat the oil and butter in a casserole dish and cook the rabbit over medium high heat for about 5 minutes or until browned. You may need to do this in 2 batches, if so, remove 1st batch of rabbit from heat and keep warm. Add the bacon to the pan and cook for about 4 minutes or until slightly crisp, remove and keep warm. Add onions to the pan and cook over high heat for 4-5 minutes until they begin to brown. Pour in the wine and stir well to remove any sediment from the bottom of the pan. Return the bacon and rabbit to the pan and add the garlic and bouquet garni, then bring to a boil, cover and place in the center of a preheated oven for 1 1/4 hours. Add the mushrooms and cook for an additional 15 minutes. Discard the bouquet garni, remove the rabbit pieces, bacon, onions and mushrooms with a slotted spoon, and put them into a serving dish. Put the pan back on a burner and bring to a rapid boil to thicken the sauce, then pour the sauce over the meat and vegetables. Serve with some crusty baguette and Bon Appetit. Posted on February 10, 2012, in Wild Game. Bookmark the permalink. 2 Comments. My youngest (20) refuses to allow me cook rabbit. When I point out that she has no problem eating ‘Bambi’, she reminds me that Thumper was the really cute one in the movie. I might give this a go and tell her it is “forrest chicken”.